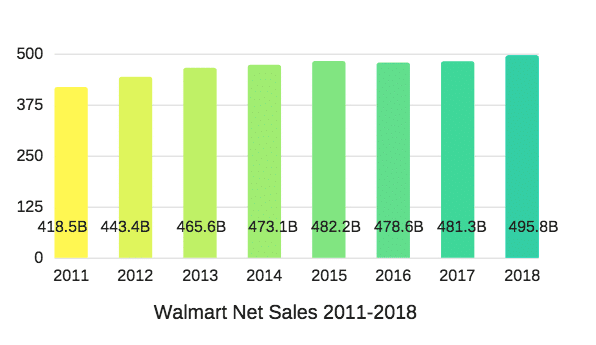 The following table shows the net sales and revenue of Walmart from 2001-2018 in Billion dollars. Revenue of Walmart crossed the 500 Billion mark for the first time in its history. Walmart’s 2018 revenue reached 500.3 Billion dollars and Net Sales 495.8 Billion Dollars. Apart from the sales of retail items, Walmart also earns from memberships and other sources of income. The net sales only represent the sales of retail products. Total revenue includes the income from the sale of memberships and other sources. This year’s (2017) performance is the best for Walmart till now. It was the strongest performance ever driven by the growing number of Walmart stores. The annual revenue approached 486 billion with operating income reaching nearly $22.8 billion. The brand operated nearly 11700 stores that serve more than 260 million people. 2015 was also an year of great financial performance when its revenue reached higher than 485 billion dollars. Again there was a fall in 2016 when revenue declined by more than 3 billions and then rose again in 2017. 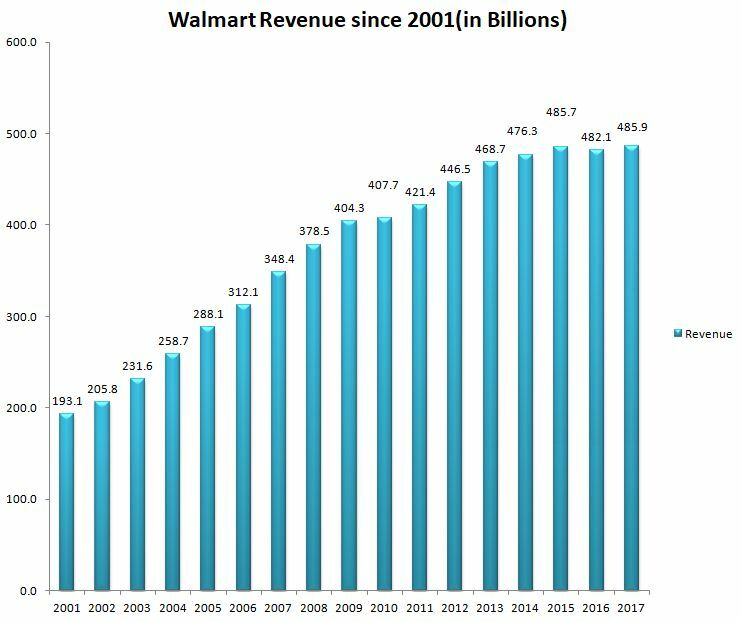 Otherwise, Walmart’s revenue has kept rising consistently since 2001. As of 2017, Walmart operated 11695 stores in 28 countries and e-commerce websites.